$20 per guest after the first two in a room and $20 per guest after the first ten up to maximum occupancy. All canceled reservations received 60 or more days prior to arrival are subject to a 50% cancellation penalty. Reservations canceled within 59 days of the scheduled arrival date are subject to a 100% penalty and are responsible for the entire stay and will forfeit all payments. For events with larger than 35 guests, there is an event fee and an additional contract for use of the barn and courtyards for entertaining. The Barn can comfortably seat 35-50 guests. Combined with outdoor seating and rented furniture, the property has served 150 people in style. There is an extra charge of for the run of the ranch. Smoking is only allowed outdoors, away from windows and doors. Pets are welcome. Pets are only allowed in the sunset casita if guests are not renting the whole house. There is a $35 pet fee for pets in the sunset casita and $100 pet fee if renting the whole house. Pets must be pre-approved/discussed and not left alone during the day. Rancho Gallina is between Albuquerque and Santa Fe on the Turquoise Trail Scenic Byway (aka highway 14). It is an hour from ABQ, 20 minutes to the Santa Fe airport, and 20 minutes from the center of Santa Fe. All the roads leading to the property are paved and well-maintained. Guests will only need an SUV/4WD if they plan to go on the backroads for hiking, climbing, etc. From Albuquerque, guests should take the 40 East to Cedar Crest/Tijeras and then the Turquoise Trail north to Bonanza Creek Road/county road 45. Take a left and the property is on the second driveway on the right. If arriving late at night or coming from the north, guests can take I-25 to 14/Turquoise Trail south. After a long empty stretch, visitors will pass the San Marcos Cafe & Feed on their right and a fire station on their left. Bonanza Creek Road is the next paved road on the right. Rancho Gallina is on the second driveway on the right. Rancho Gallina is a unique eco-retreat in the foothills south of Santa Fe. Located 20 minutes from the center of town on the Turquoise Trail Scenic Byway, this historic, authentic New Mexico ranch is commended for its 21st century amenities like Wi-Fi, solar/geothermal energy, luxe bedding and linens, and cedar soaking tub under the stars. Guests also have the option of ordering chef-prepared breakfasts or celebration dinners in their fabulous barn. Because the ranch is in a horse country, there are many wranglers and horse whisperers who offer rides and training nearby. Rancho Gallina is also in one of the best cycling areas in New Mexico - rolling hills, open views and limited traffic. State and National Parks (Bandelier, Kasha Katuwe/Tent Rocks, Hyde and Cerrillos State Parks and Galisteo Basin) offer hiking and mountain biking within an hour's drive. The Ranch has five unique bedrooms furnished in "rough-luxe" style with high quality bedding, regional and global folk art, as well as leather and rustic wood touches. They range in size from a private room with a bath to a two-room suite sleeping up to 7 guests. 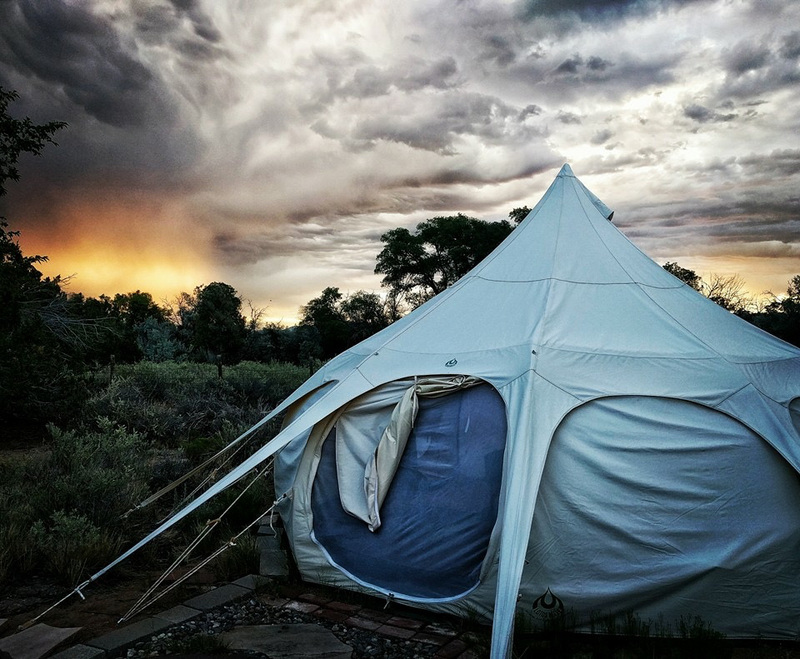 The property also offers a 16' Lotus bell glamping tent deeper on the property with a king bed or two twin beds, field kitchen, composting toilet, and covered dining area. Rancho Gallina has served as a fabulous place to gather and celebrate reunions, retreats and weddings. A sweet garden room surrounded by lilac bushes and elm trees, this two room suite opens to the main courtyard. It has a queen bed and writing desk, a kiva fireplace, and a separate sitting/dressing room with a single futon lounger for an additional guest. Private bath with claw foot tub/shower combo (large step up). This room also opens to the original ranch house, and shares the ranch kitchen and living room with other guests. Beautiful large casita (600 sq.ft. ), with a west facing picture window for sunset views over the Lone Butte. Kiva fireplace, queen bed, leather euro lounger (folds to a bed with memory foam topper for an additional adults or kids), dining area all in one beautiful beamed room. Kitchenette with a gas stove, microwave and toaster. Modern bath with a glass and tile shower and separate dressing area. Opens to the main courtyard and fountain. This 16' Lotusbelle tent offers a bit of outdoors (coyotes, owls and birdsong) without having to carry lots of gear around. Guests have access to an outdoor kitchen with limited running rainwater, a gas grill, and covered dining - or access to a shared full kitchen in the main ranch house. The tent can be configured with either a King bed or two Twin beds, both options with down comforters, linen duvet, and down pillows. There is a nearby composting toilet, cold water outdoor shower, and an indoor shower while the owners are up and about. Prices include breakfast during the summer only. There are discounts available for self-catering glamping. Opening to the front courtyard, this room has beautiful beams and clerestory windows to take advantage of the desert light and air. It has a rustic queen wrought iron bed and writing desk, with a shower and powder room (flanked by inlaid Moroccan doors, hence the room’s name). Adjacent to the Kiva Room and in the original ranch house, this room shares the ranch kitchen and living room with other guests. [Note: the geothermal air handler is adjacent to this room, light sleepers beware]. An artist’s dream, this giant two room suite boasts a 600 sq.ft. studio filled with light – 8 skylights and a wall of east-facing glass doors. Silverado has a beautiful bedroom with traditional latilla ceilings, wrought iron canopy queen bed, and south facing windows opening to the front courtyard. The bedroom opens to the studio, which serves as a living area, yoga studio, or art space, and is outfitted with an extra long twin day bed and full futon with memory foam toppers for overflow guests (families have slept up to 7). A private sunrise portal/patio is the perfect spot for morning coffee. Private bath with shower, in-room amenities include toaster oven and dorm fridge. This historic ranch on the Turquoise Trail sleeps 10-18 guests. Bell tents and barn bedrooms can be added for weddings, reunions and retreats. The eco-conscious property is solar powered with geothermal heating/cooling.